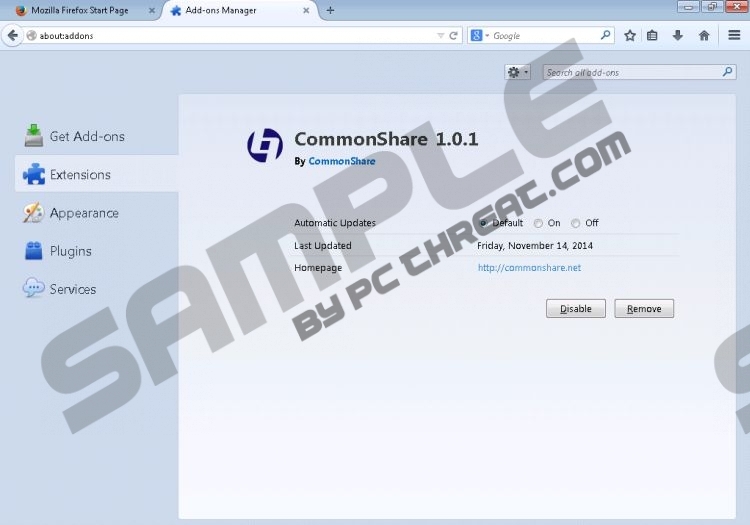 CommonShare is a SuperWeb browser add-on displaying third-party commercial and non-commercial offers. The program displays pop-ups, coupons, web banner, in-line ads, interstitial advertisements, and other types of advertisements, but none of the ads displayed are endorsed by the creators of the program, which means that you are responsible for your interaction with third parties. Due to the behavior exhibited, the CommonShare browser add-on falls into the category of adware, and we urge you to take action right now. If you want to browse the Internet without being bombarded with suspect pop-ups, you should remove CommonShare from the computer as soon as you can. CommonShare is one of the many identical programs of SuperWeb, and, like the majority of the programs owned by this software developer, the program has its official website commonshare.net. However, the fact that you can get the information about the program on the so-called official website does not mean that CommonShare is legitimate. CommonShare is also bundled with other free programs and is presented as an additional and, usually, optional program. In order to prevent additional programs, some of which may be unreliable, it is worth paying close attention to the information provided during the installation. You should review the license agreement or privacy statement and uncheck boxes related to the installation of unknown browser add-ons, media players, etc. We recommend that you remove CommonShare as soon as you can because the program is capable of monitoring you. Similarly to other advertising-supported browser add-ons, the CommonShare program records information related to your use of the Internet. The developers of the program are interested in your search terms, clicks, time spent on various websites, browsing history, language settings, and other anonymous information. In some rare cases, anonymous information may be recorded, too, but you should not wait until it happens. Remove CommonShare from the computer right now, and make sure that the system is protected against malware and spyware. Our instructions below should help you uninstall CommonShare, but our advice is to implement SpyHunter. This real-time security program is programmed to remove SuperWeb programs and many other unreliable applications, including ransomware infections, rogue anti-virus tools, browser hijackers, rookits, Trojan horses, etc. Your operating system can get infected at any time, so take action right now if you do care about your online privacy. Remove the program displaying annoying pop-ups. Remove the CommonShare browser add-on. If you want to make sure that all the components of the adware program are deleted, install the scanner available below. Quick & tested solution for CommonShare removal.